RV Bodily Injury Liability and RV Property Damage Liability are two very important coverage options that you will need to consider when purchasing a new policy for your motor home. To better understand what is meant by Bodily Injury Liability and Property Damage Liability, we first must define what “liability” means. A liability is legal responsibility, and for the purposes of insurance, it most often means an obligation to pay a debt. So, if you are involved in an accident that results in either injuries to other persons or damages to other people’s property, and if you are also found to be at fault, or to be the cause of the accident, then you would typically also be liable for the financial costs required to treat those injuries and also repair or replace any property that has been damaged. In addition to providing coverage for the costs of medical treatments and repairing or replacing damaged property, RV Bodily Injury and Property Damage Liability coverage is also often used to compensate for time lost from work due to injuries, the cost of legal representation for the injured parties, to pay for nursing care and long-term rehabilitation, to compensate for pain and suffering, and provide for funeral expenses. Bodily injury liability coverage does not cover your own injuries, which are typically covered by Personal Injury Protection instead. Bodily injury liability coverage also does not cover the injuries of any other named insured, or any named driver on your policy. It applies instead, for the most part, to people who are outside of your vehicle, but may also provide coverage for passengers who are riding inside your vehicle when an accident occurs. While nearly every state has a legal requirement, that at least a minimum amount of coverage be in place, in order to get a vehicle registered, there are a few that do not. However, it still not a very good idea to skip adding this important coverage to your policy, since it can potentially protect you from huge debts that may be caused by expensive medical treatments as well as costly legal fees. 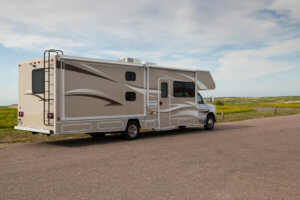 The limits of coverage available for RV Bodily Injury Liability and RV Property Damage Liability are typically displayed as either Split Limits or Combined Single Limits. The first amount shows the limit of Bodily injury liability coverage per person, the second amount displayed shows the limit of Bodily injury liability coverage per accident, and the third figure shows the limit of Property Damage liability coverage per accident. So, in the example above, the policy would pay up $100,000.00 per person and up to $300,000.00 per accident for bodily injuries, and would also pay up to $50,000.00 per accident for property damages. This amount indicates the highest limit of coverage that the insurer would pay towards either Bodily injury expenses or Property Damage expenses. So in the example above, the policy would pay up to $500,000.00 per person or accident for all bodily injuries and property damages combined. When considering which limits or the amount of liability coverage you should choose for your RV policy, it is important to consider what your assets are, and how important it is to protect those assets. If you are ever involved in an accident and also found to be at fault, the cost of the subsequent medical treatments and property repairs could literally become your legal responsibility. Ideally, you should select limits of coverage that are equal to or greater than the value of all your combined assets. Your insurance policy should have sufficient coverage to be able to pay for the injuries or damages that are found to be your fault, without you being forced to sell any of your assets. So, if you own a home, a car, an RV, a boat and have investments that all together have a total value of, let’s say $489,000.00, you should look for at least a limit of $500,000.00 Bodily Injury Liability coverage per accident to protect you and your assets. Our team of licensed experts is ready to offer advice and help you get the RV Bodily Injury and Property Damage Liability coverage limits that you need. Start your quote online and let us shop the market for you. If you need coverage immediately please call us now at 877-784-6787!